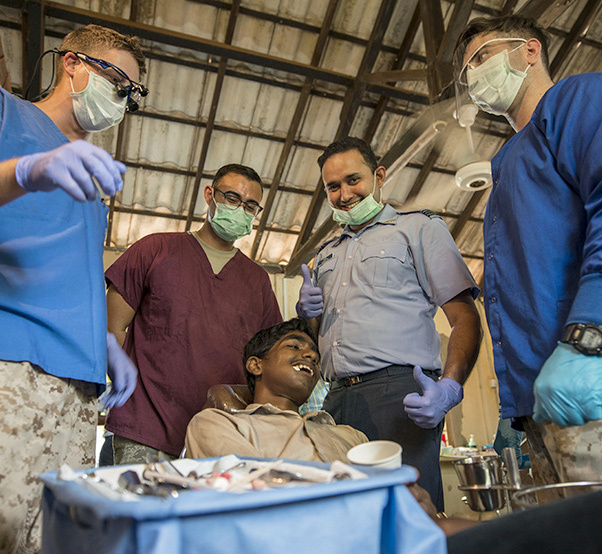 Members from the U.S. Navy, U.S. Air Force and Sri Lankan Air Force smile after a tooth extraction during Pacific Angel 16-3 in Jaffna, Sri Lanka, Aug. 16, 2016. Operation PACANGEL 16 is a joint and combined humanitarian assistance operation. Led by Pacific Air Forces, the exercise enhances participating nations’ humanitarian assistance and disaster relief capabilities while providing needed services to people in need throughout Southeast Asia. The United States and Sri Lanka will conduct humanitarian assistance engagements during Pacific Angel 2018 (PAC ANGEL) , Aug. 13-18, 2018. PAC ANGEL is an annual joint and combined humanitarian assistance and disaster relief engagement that includes general health and engineering programs, as well as various subject-matter expert exchanges. During this exercise, approximately 65 U.S. military members will partner and train with Sri Lankan service members, local non-governmental organizations and partner nations. PAC ANGEL Sri Lanka is one of four PAC ANGEL humanitarian assistance engagements taking place in 2018. Earlier this year, Pacific Air Forces conducted events in Timor Leste and Vanuatu, with one more engagement scheduled for Vietnam. Now entering its 11th year, PAC ANGEL ensures the region’s militaries are prepared to work together to address humanitarian crises. Since 2007, PAC ANGEL engagements have impacted the lives of tens of thousands of people and developed regional HA/DR and partnership capacities.